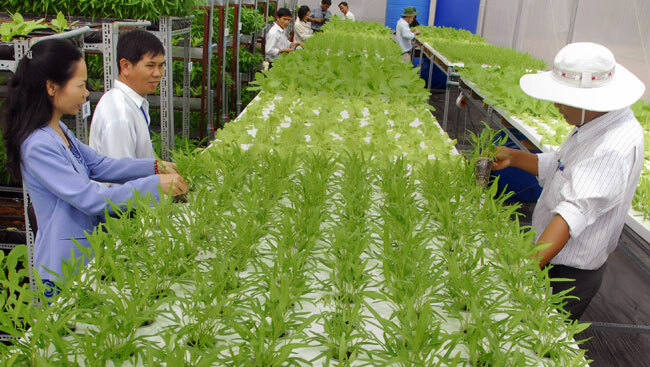 HCM CITY (VNS) — New policies that would attract investment in the hi-tech agriculture sector would create a breakthrough in production and consumption of farm produce, the HCM City Department of Agriculture and Rural Development has recommended. Although the city has paid attention to enhancing advanced technology in agricultural production in the past, the value of agricultural production has grown at a modest rate of about 5 per cent per year. The average revenue per hectare under agricultural production in the city is about VND280 million (US$13,213) per year. If maintaining such a growth rate, the sector would reach the production value of VND800 million ($37,753) per hectare by 2020 as set in the master plan for agricultural restructuring, the department said. Le Minh Dung, deputy director of the department, said the city was calling for enterprises to invest in the hi-tech agricultural sector and develop models for incubating businesses to reach the target. Besides better policies, the city needed to focus more on solving financial difficulties faced by enterprises, he said. Many firms were not interested in investing in the hi-tech agricultural sector, saying that it requires a large amount of capital, but has low economic efficiency. Credit institutions were not interested in providing loans to enterprises because of the low profits. Le Thanh Nguyen, director of Sai Gon Hi-tech Park Incubation Centre, said the centre had worked with many investment funds, but they were only interested in real estate and information and technology sectors. The agricultural sector had low capital turnover and high risks, he added. The Government had no investment fund designed to support a business incubation programme, while in other countries in the region such as Malaysia and Singapore, the Government set aside large investment funds for this kind of activity.